A New York Times article that includes information on some of the issues that Haitian refugees faced. This website seeks to inform its viewers on Cuban and Haitian refugees and the numerous struggles that these individuals faced in search of protection in the United States. Coming to America in hopes of living a better life than the one they were leaving behind, Cuban and Haitian Refugees wanted to live Thomas Jefferson’s famous phrase of “life, liberty, and the pursuit of happiness” instead of living in lands of poverty and political turmoil. Based off of documents from the Endres collection at Center for Migration Studies, this website showcases legal documents regarding the enactment of legislation concerning immigration from 1970 to 1980. While many Cuban and Haitian refugees made their way to the United States in hopes of bettering their lives, many continued living a life of struggle due to the fact that they were discriminated against. Being that these individuals faced such torment and victimization, it was apparent that legal action was necessary to protect the lives of these immigrants. Pictured left is a newspaper article from a 1984 edition of the New York Times. 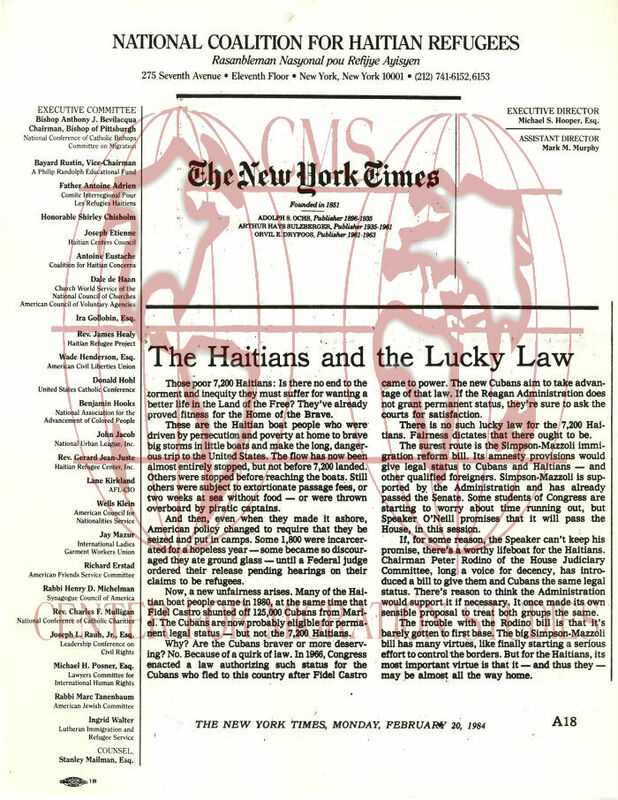 This article specifically raised public awareness on the issues that Haitian refugees faced and ultimately created a general awareness for the need of a piece of legislation that would protect the rights of Haitian immigrants, ultimately making their entitlement to life, liberty, and the pursuit of happiness apparent to all. This entry was posted in Center for Migration Studies (NY), Exhibits and tagged Cuban and Haitian Refugees, Endres Collection, Pursuit of Happiness. Bookmark the permalink.